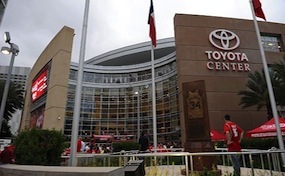 The Toyota Center is an indoor arena located in downtown Houston, Texas. It is named after the Japanese automobile manufacturer Toyota. The arena is home to the Rockets of the National Basketball Association, the principal owners of the building, and the Aeros of the American Hockey League. The arena's first event was a Fleetwood Mac concert on October 6, 2003, and the first Rockets game at the Toyota Center was against the Denver Nuggets on October 30. In its first year, the total attendance for events at the arena exceeded 1.5 million. The arena was also the winner of the Allen Award for Civic Enhancement by Central Houston, the "Rookie of the Year" award by the Harlem Globetrotters, and a finalist for Pollstar Magazine's "Best New Concert Venue" award. The current attendance for a concert held at the arena was set on November 20, 2008, when Metallica played to a sold out crowd during the Death Magnetic tour. The record for a basketball game is 18,501, set on May 14, 2009, when the Rockets defeated the Los Angeles Lakers in Game 6 of the Western Conference Semifinals, 95-80. CenterHouston.com is a privately held company that specializes in the sale of tickets in the secondary market. We are not affiliated with any official supplier or box office. To purchase tickets to any Toyota Center in Houston events simply call our operators at anytime or click on the event you wish to attend.